Be the first to share your favorite memory, photo or story of Wilbert. This memorial page is dedicated for family, friends and future generations to celebrate the life of their loved one. Wilbert Clayton (Willy) Goebel, 77 of Coeur d’Alene, Idaho was born on September 23, 1941 in Lehr, North Dakota to Philip Goebel and Delores (Schlect) Goebel. 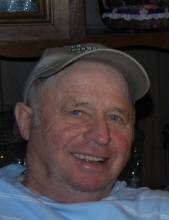 He passed away on Monday, April 8, 2019 in Coeur d’Alene, Idaho with his beloved wife of 58 years by his side. Willy grew up in Lehr, ND where he attended school until 8th grade, then went to work on farms to help his family. On April 7, 1961 Willy married Eleanor Kathryn Haak in Wishek, North Dakota. The two met at the Union Stock Yard in Fargo, North Dakota. They lived in Pinehurst, Idaho from 1961 – 1986. While in Pinehurst, Willy worked at Bunker Hill as a Miner for 20 years. In 1986, Willy and Elly moved to Coeur d’Alene, Idaho. Willy worked at A&M Hardware as a welder for another 20 years. While working full-time, Willy also did lawn care on the side. Willy taught his family integrity, commitment, and the value of hard work, doing whatever necessary to provide for his family. Willy was a man of few words, instead showing everyone his love through his actions. But when he did speak, his words were carefully chosen and full of whit. A kind and selfless man, it was often said that Willy would give you the shirt off his back. Willy enjoyed being active and was always on the go. When Willy wasn’t working, his hobbies included: hunting, camping, ice fishing, gardening at home, working on family and friends’ cars, raising chickens and selling their eggs, and playing games (Farkel, Cribbage, Monopoly, Sorry, and Dominos are a few of his favorites). Wilbert is survived by his wife Eleanor Goebel; son Dale (Diane) of Athol, ID; daughters Nancy (Randy) Howard of Hayden, ID, Pamela Smith of Coeur d’Alene, ID, and Suzanne Adkinson of Post Falls, ID; brothers Darvin Gobel of Wishek, ND and Gary (Deb) Goebel of Wishek, ND; sisters Shirley (Lawrence) Riley of Black Hawk, SD, Ruby Stevahn of Jamestown, ND, Lyla Kaesman of Bismark, ND, Sharon Wuolle of Fargo, ND, and Linda Gahner, Fargo, ND; numerous nieces and nephews, 14 grandchildren and 7 great-grandchildren. Wilbert is preceded in death by his parents Philip Goebel and Delores (Schlect) Goebel and his sister Della Stoebner. Funeral services will be held on Monday, April 15, 2019 at 10:00 AM at Lake City Church, 6000 N Ramsey Rd, Coeur d'Alene, ID 83815. Donations in honor of Wilbert may be directed to Hospice of North Idaho. To send flowers or a remembrance gift to the family of Wilbert "Willy" Goebel, please visit our Tribute Store. "Email Address" would like to share the life celebration of Wilbert "Willy" Goebel. Click on the "link" to go to share a favorite memory or leave a condolence message for the family.